Thanksgiving is right around the corner. And although there is no shortage of advertisements or store displays to remind us that we should enjoy a healthy, heartfelt, joyous holiday season, the reality is that, for most of us – and especially for those of us managing depression – this time of year puts our physical and emotional resilience to the test. So here’s an idea: rather than dread the season and allow it to take a toll on our wellbeing, why not turn the tables on all the material hoopla and unrealistic expectations and adopt a different perspective for the holidays? 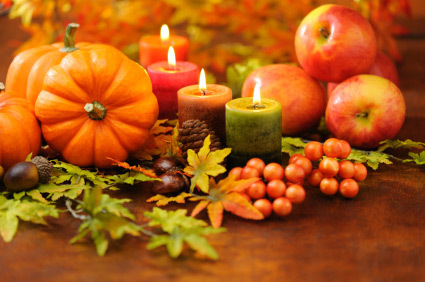 Harvest festivals worldwide are built around expressing gratitude for the season’s harvest. Since you first began working on managing your depression, what lessons, changes, or insights have you “harvested” to help you live a healthier life? Maybe you’ve established a new exercise routine or learned new ways to cope with stress. There’s reason to be grateful for every positive step you’ve taken. On the road to wellness, no accomplishment is too small to celebrate – they are the fruits of your harvest. Some festivals coincide with the Winter Solstice, the shortest day of the year, reminding us that the days ahead will be brighter. For many people, the shorter, darker days of winter tend to aggravate the symptoms of depression. Rather than hibernating while you wait for the season to change, why not take some deliberate steps to try to make your winter days brighter? Think of the steps you take to manage your depression as giving yourself more moments of daylight each day. Our Weekly Motivator tool can help you keep track of the things you’re doing to “lighten up,” including eating right, exercising, spending time with others, and making time for fun. People in some Asian countries carry brightly colored lanterns, eat sweet cakes and burn incense as part of their harvest festivals. You too can take the time to engage all of your senses – paying specific attention to the sights, smells, sounds, tastes and feel of each moment – as ways to stay present in the moment. You can also explore techniques like meditation and mindfulness, which have been shown to not only focus the mind, but help reduce pain, manage stress and improve overall wellness. In India, the harvest is marked by flying beautiful, colorful kites to signify reaching for the very best in life. With every step you take toward wellness you are reaching for the best. What goals are you reaching for? If you’re not sure, our goalsetting worksheet might be a good place to start. In some cultures, this season also means getting rid of the old to welcome the new. Every plan for treating depression is a roadmap to transformation, as unhelpful thoughts and habits are replaced with new, healthier ways of coping. What can you dispose of to feel less burdened? A longstanding grudge? A troublesome habit? The highlight of some British, Caribbean and Canadian harvest festivals is the distribution of locally-grown foods to the underprivileged in the community. Doing for others is a proven way to empower yourself and move beyond focusing on your own troubles. More ideas for empowering yourself can be found here. Some harvest celebrations emphasize spiritual or religious components, offering an opportunity to reflect on mankind’s closeness to nature, and reminding us that the process of growing food is truly miraculous. For many people with depression, developing a spiritual connection is an important step toward regaining wellness. Research suggests that cultivating some sense of spirituality can contribute to better mental health by strengthening one’s sense of identity and purpose, and that it can be a source of strength and comfort when faced with adversity. You’ll find tips on building your own spiritual practice here. Many traditions reflect on the hard work that makes a harvest possible. Managing depression is hard work too, and there’s no annual holiday to celebrate it. Many people with depression tend to be their own worst critics, focusing only on how far they still have to go. Instead, take a moment this season to engage in some positive self-talk, and pat yourself on the back for the hard work you’ve done so far. We hope we’ve provide some “food for thought” for this year’s Thanksgiving table. Staff of the University of Michigan Depression Center contributed to this article. Are you doing all you can to manage your depression? Check in with yourself and find out.